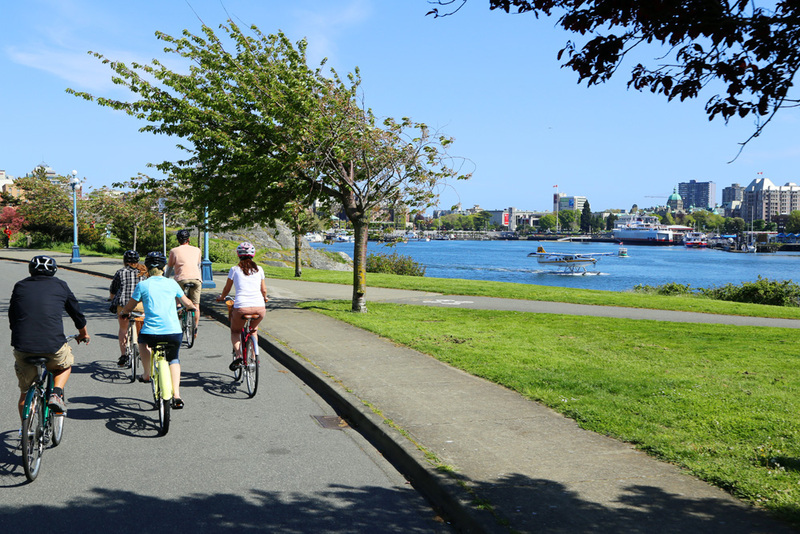 Delicious sunshine makes this the perfect day to explore this beautiful city on two wheels. 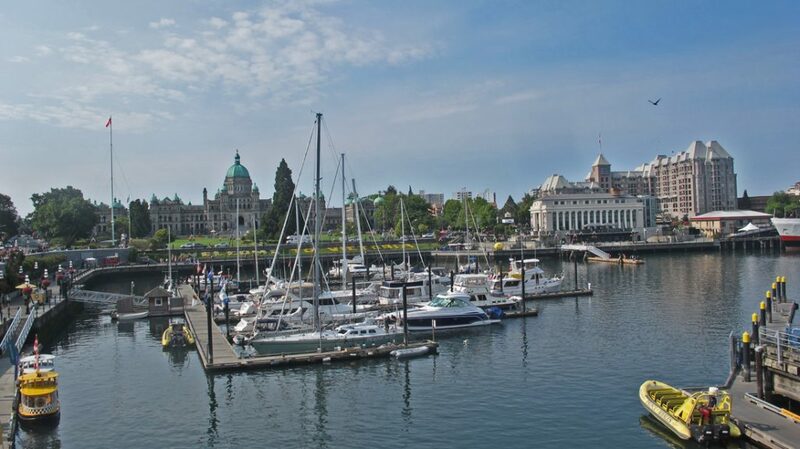 I set out to see if Victoria, British Columbia lives up to its moniker of most bike friendly city in Canada. 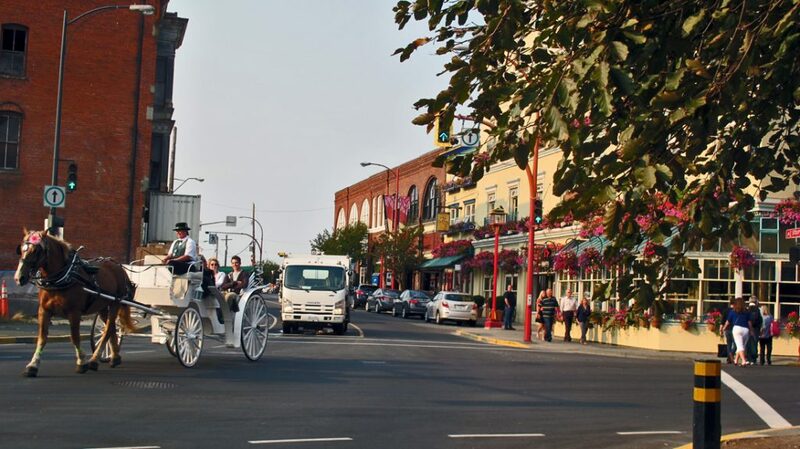 Just a short block from the harbour with its iconic views of the provincial parliament buildings and the Empress Hotel, Shawn, one of the owners of The Pedaler, fits us out with comfortable bikes and mandatory helmets. And we’re off on our tour. It’s not hard to see why seven percent of Victoria residents cycle to work. Blessed with mild weather, few hills, a network of bike trails and bike friendly drivers, cycling is also a great way to explore this city. 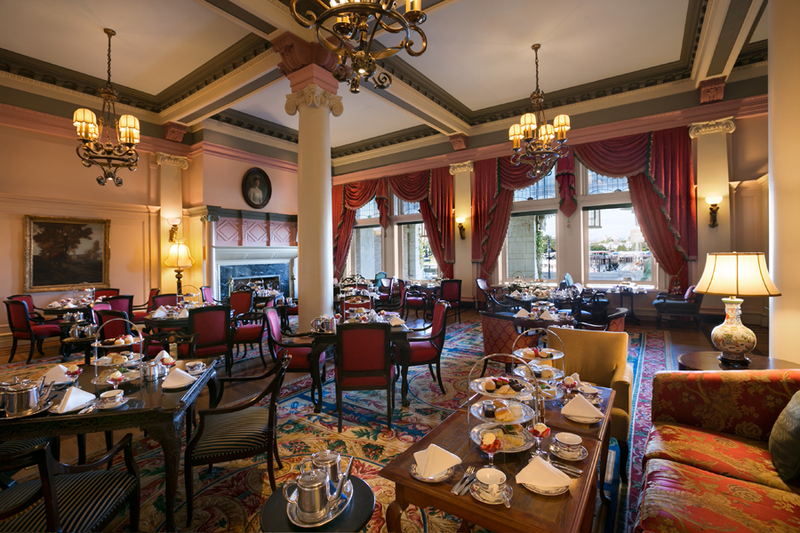 Afternoon tea at the iconic Empress Hotel is a must for many visitors to the city. In fact, when it comes to brews, Victoria has moved a long way from the classic image of afternoon tea at The Empress. In the 1980s, craft beer came to town with Spinnakers, one of Canada’s first brew pubs, and according to many, still one of the best. 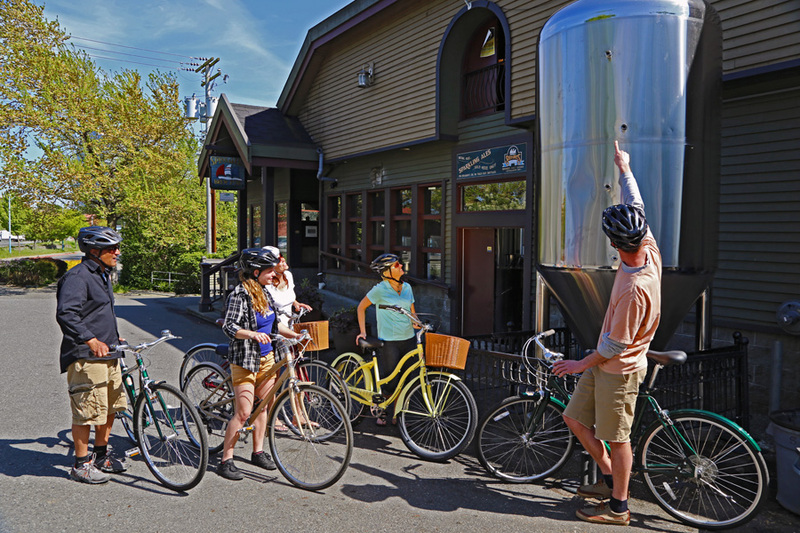 The Bike Tour stops at Spinnaker’s, the first craft brewery in the area. Since then, many have come and gone. But talk to locals and invariably Phillips Brewery, a craft brewery begun by local entrepreneur Matt Phillips, comes up. It’s not pretty but this is a favourite spot for good coffee. 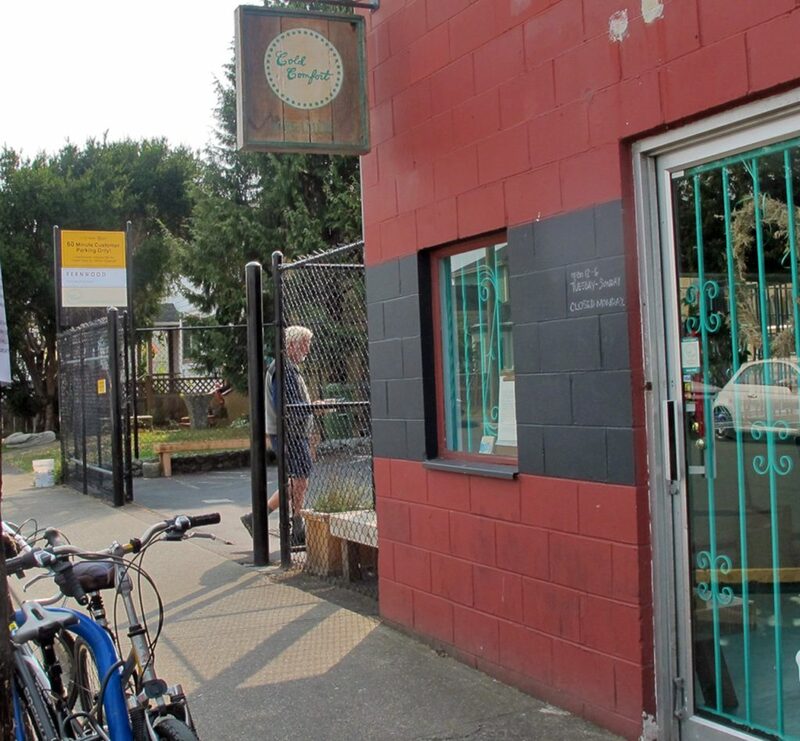 It’s a little early for beer so we stop for a different kind of brew at the Parsonage Cafe, serving coffee from the Fernwood Coffee Company in the eponymous neighbourhood. Out back are sacks of beans from countries like Brazil, Ethiopia and Costa Rica, from which Rek Feldman produces great brews, including a unique version of iced coffee he calls Cold Brew, because it’s made with cold water. Cold Comfort Creamery makes non-GMO ice cream in delicious flavours. Try their ‘sammie’ – ice cream between two macaroons! Indeed, this area is all about the unusual. Next door, Cold Comfort dispenses homemade ice cream, with flavours created according to the season − more than 300 so far and all of them GMO free and locally sourced. A must try is the ‘sammie’, yummy ice cream sandwiched between two macaroons. Heavenly. But this is, after all, Victoria so the third brew is inevitably on the menu. 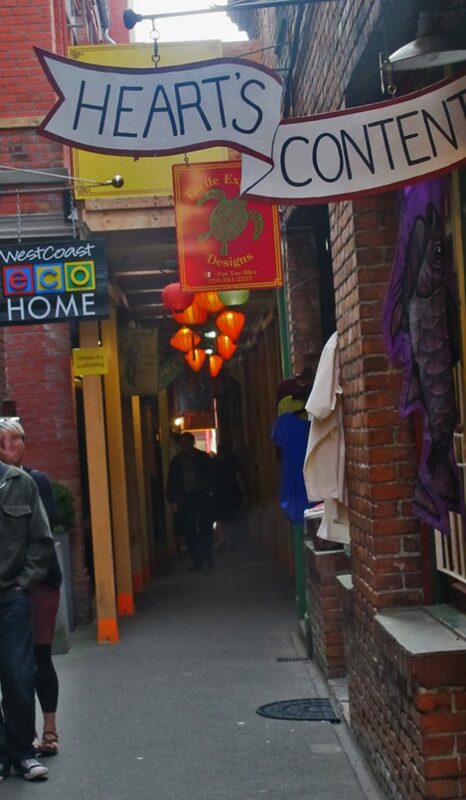 We wind our way to the oldest Chinatown in Canada, and a stop at the Silk Road Tea Company. 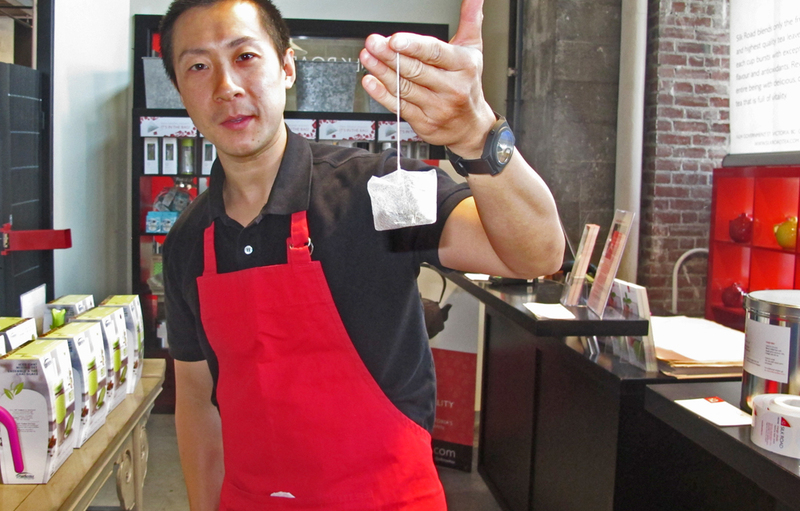 Tea at the Silk Road tea company comes loose and in little silk bags. 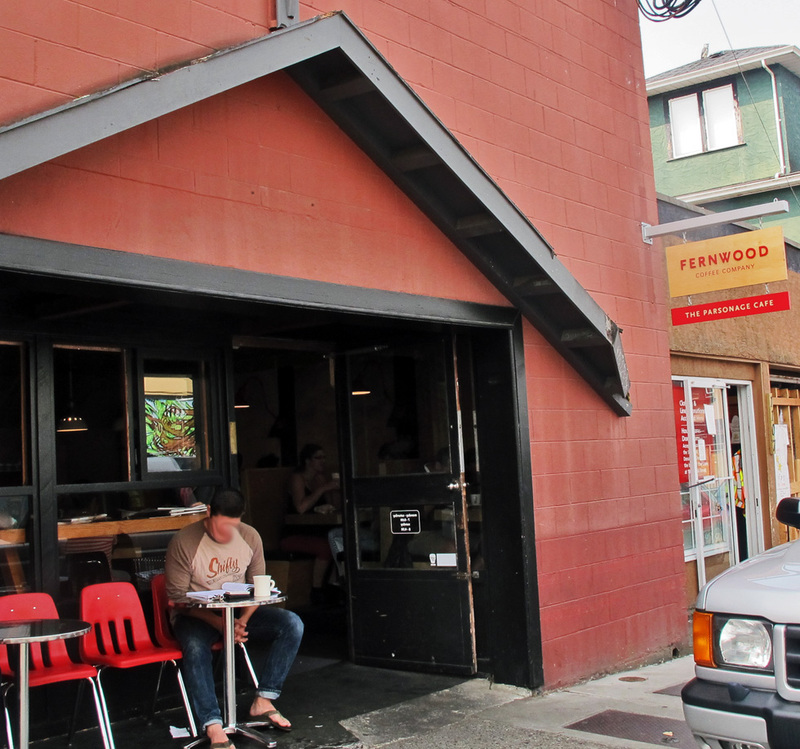 There’s another branch in the nearby Victoria Public Market at the Hudson, which we discovered yesterday. We were drawn by the beautiful old building which once housed the Hudson Bay Company. Coincidentally, this company provided the land for the very first market in Victoria, back in 1860. Today, the Victoria Public Market has become a gathering place for local producers and the citizenry to meet, to chat, to sample, to eat. 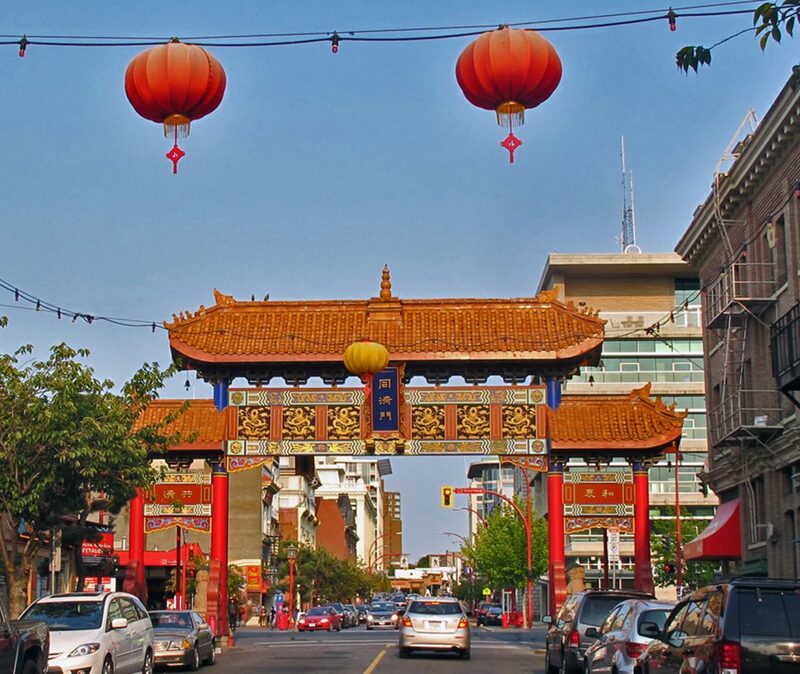 The Gate of Harmonious Interest is the entrance to Victoria’s Chinatown. Reminiscent of Hong Kong markets, Chinatown’s sidewalks bustle with crammed market stalls spilling out of the shops. The entrance to Chinatown is dominated by the ornate ‘Gate of Harmonious Interest’ contributed by sister city Suzhou in China. And of course, everyone must walk along the incredibly narrow Fan Tan Alley, which only marginally widens into a mini-mews. 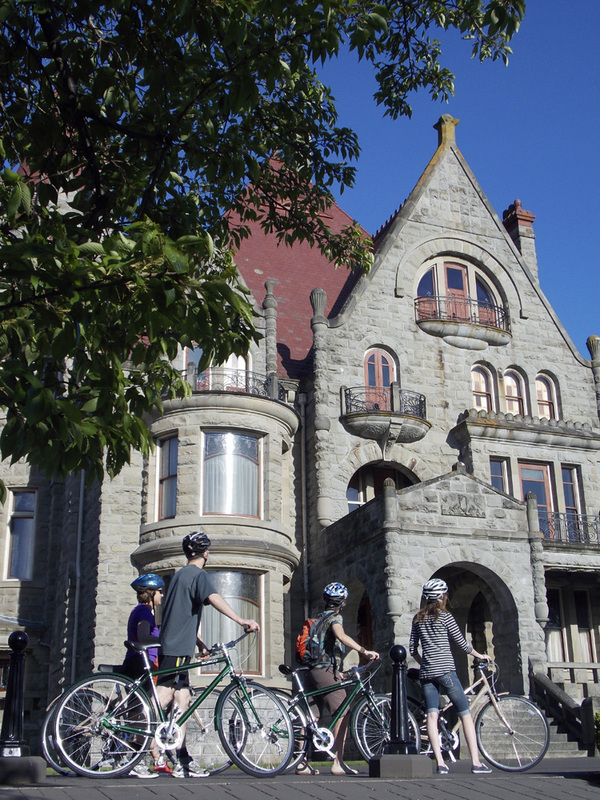 Our bike tour is titled Castles, Hood & Legends, so, having covered some ‘hoods’, we make a stop at Craigdarroch Castle built in 1890 by coal baron, Robert Dunsmuir, who never lived to see its completion. Nor did the architect, Warren Heywood Williams, who designed it. Shawn gives us a potted history but the building’s chequered past is part of the interior castle tour. We’ll have to come back for that. We’re moving on to Government House, with its magnificent gardens, lovingly tended by a rota of volunteers. Back at The Pedaler, we return our bikes and head to the bustling harbour nearby. Large ships and small sightseeing boats fill the berths and the warm weather has drawn crowds to the outdoor market stalls. I find myself coveting some beautifully wrought jewelry and carved wooden pieces by native artists. 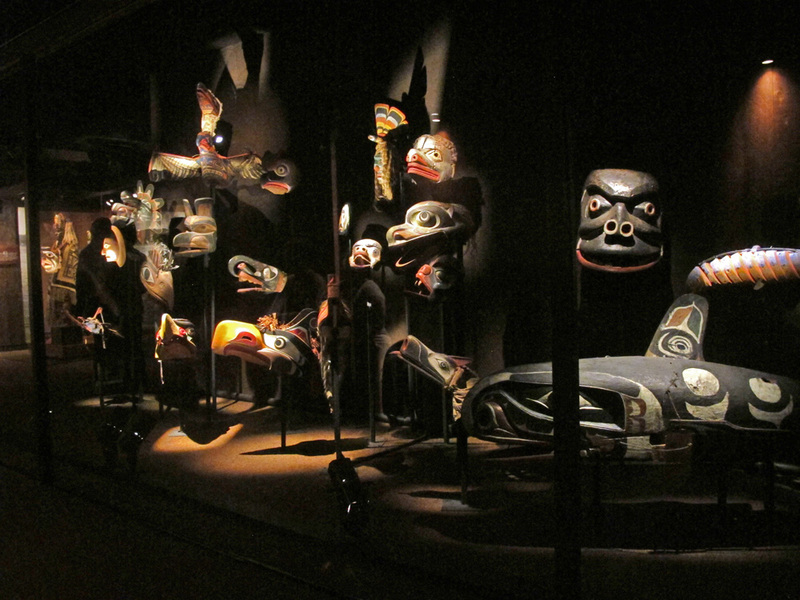 And speaking of art, the art of West Coast peoples is remarkable in its vitality and colour. 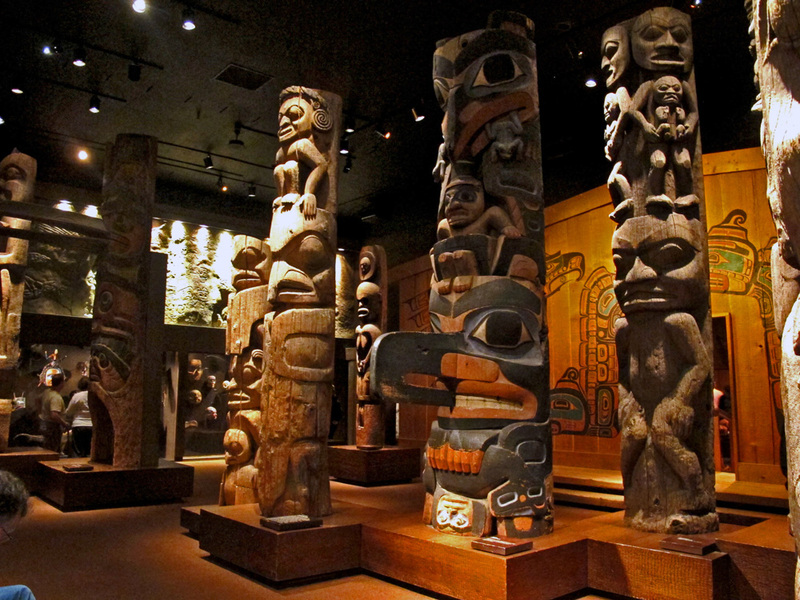 The best place to see it is at the Royal BC Museum by the harbour. While I stop to admire the totems outside this building, the totems, masks and other art inside the museum really take my breath away. Don’t let the ‘museum’ put you off. The Royal BC is a must-see. There are plenty of pubs from which to choose. But even the pubs here are pretty with floral baskets. It’s 6 p.m. and time for one of Victoria’s brews – I’ll let you guess which one. 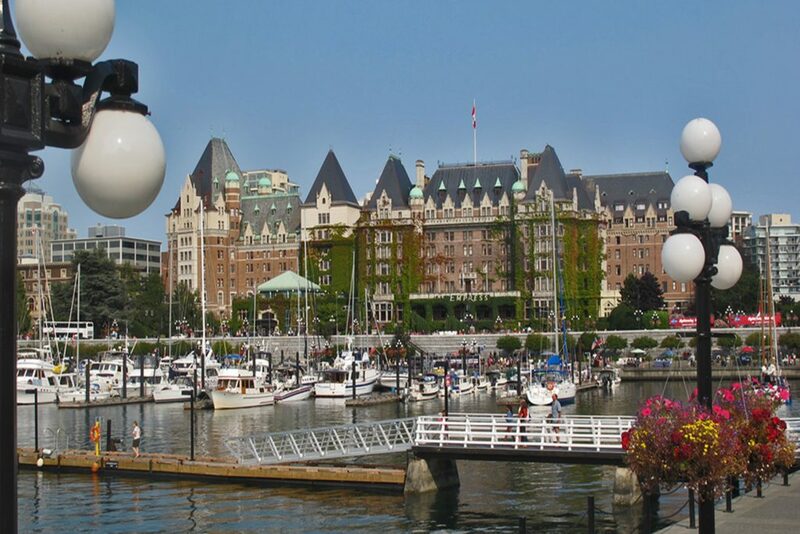 This entry was posted in Blog, British Columbia, Food and tagged B.C., beer, Beinjing Night Market, bike tour, Chinatown, Chinatown Victoria, coffee, Cold Comfort Creamery, craft brewery, Market Victoria, Royal BC Museum, Silk Road Tea, tea, tea at The Empress, The Empress, Victoria by Liz Campbell. Bookmark the permalink.